The NFL Network is reporting that the New York Giants will not re-sign soon-to-be unrestricted free agent tight end Larry Donnell. Donnell began the 2016 season as the starting tight end but was benched after the bye week. He started to receive more playing time again late in the season. Donnell ended up playing in 14 games with six starts, and finished the regular season with just 15 catches for 92 yards (6.1 yards per catch) and one touchdown. Donnell originally went undrafted and unsigned in 2011. The Giants signed him as a street free agent in March 2012 and Donnell spent the 2012 season on the team’s Practice Squad. Donnell has regressed since his breakout 2014 season (63 catches for 623 yards and six touchdowns). His numbers were down in 2015 (missing half the season with a neck injury) and down again in 2016. He just has not developed as hoped or expected. The West Coast Offense, particularly the Green Bay Packers version that Ben McAdoo brought to the New York Giants, is heavily dependent on the performance of the tight ends. Entering the 2016 training camp, pundits and fans outside of the organization worried that the Giants had not invested enough serious resources to address the position. Both leading candidates to start (Larry Donnell and Will Tye) were former undrafted rookie free agents. The position was not addressed in the 2016 Draft until the 6th round (Jerell Adams). The other two prospects in the picture were also undrafted free agents (Matt LaCosse and Ryan Malleck). One would be hard pressed to name a worse group of tight ends in the NFL. Larry Donnell began the 2016 season as the starting tight end but was benched after the bye week. He started to receive more playing time again late in the season. Donnell ended up playing in 14 games with six starts, and finished the regular season with just 15 catches for 92 yards (6.1 yards per catch) and one touchdown. Donnell originally went undrafted and unsigned in 2011. The Giants signed him as a street free agent in March 2012 and Donnell spent the 2012 season on the team’s Practice Squad. Donnell has regressed since his breakout 2014 season (63 catches for 623 yards and six touchdowns). His numbers were down in 2015 (missing half the season with a neck injury) and down again in 2016. He just has not developed as hoped or expected. Donnell has good size and flashes athletic ability, but there is a klutziness to his game and he is far too inconsistent as a blocker and receiver. He also has issues holding onto the football (five career fumbles). In his second season, Will Tye was promoted to the starting tight end spot at midseason after the bye week. He played in all 16 regular-season games, with 10 starts, and finished the year with 48 catches for 395 yards (8.2 yards per catch) and just one touchdown. Tye was originally signed as a rookie free agent after the 2015 NFL Draft by the Giants. In 2015, he played in 13 games with seven starts, and finished the season with 42 catches for 464 yards and three touchdowns. Tye was voted to the Pro Football Writers NFL All-Rookie Team. Tye is a good athlete with fine speed. His lack of size does limit him as a blocker, and receiver when it comes to out-muscling defenders for the ball. Despite more playing time in 2016, his productivity over his rookie season did not increase. Jerell Adams was drafted by the Giants in the 6th round of the 2016 NFL Draft. Adams played in 13 games with two starts, and finished the regular season with 16 catches for 122 yards (7.6 yards per catch) and one touchdown. Adams combines excellent size with good overall athletic ability. He has the tools to become a quality blocker and receiver if he works hard and develops his potential. Adams adjusts well to the football, has good hands, and flashes some run-after-the-catch ability. The Giants waived/injured Matt LaCosse in late August 2016 and then placed him on Injured Reserve with a knee injury that required surgery. LaCosse was originally signed by the Giants as an undrafted rookie free agent after the 2015 NFL Draft. The Giants waived/injured him in August with a hamstring injury and re-signed him to the Practice Squad in November and the 53-man roster in December 2015. He played in two games and finished with three catches for 22 yards. LaCosse is a versatile player who played tight end, H-Back, and fullback in college. LaCosse has good speed and catches the football well. The New York Giants have signed center Khaled Holmes to a reserve/future contract. The 26-year old Holmes was originally drafted in the 4th round of the 2013 NFL Draft by the Indianapolis Colts. In three seasons with the Colts, Holmes played in 17 regular-season games with nine starts. 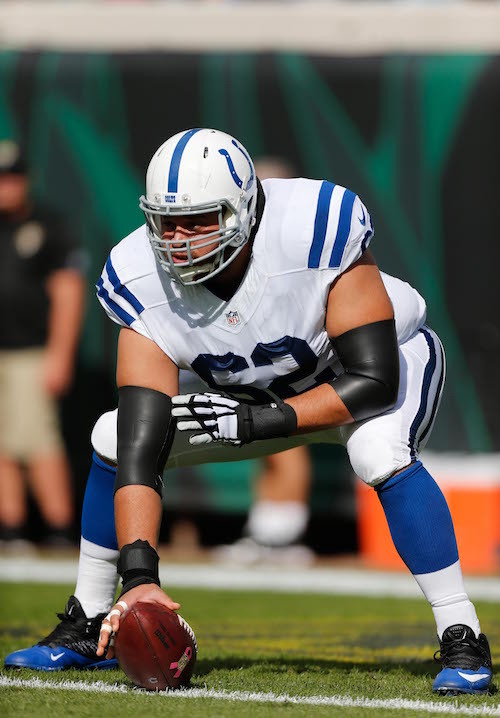 The Colts waived him in May 2016. He then spent a couple of weeks with the Chicago Bears before being waived in the final cuts. Holmes has a nice combination of size, arm length, and agility. Lacking power and strength, he is more of a positional blocker. 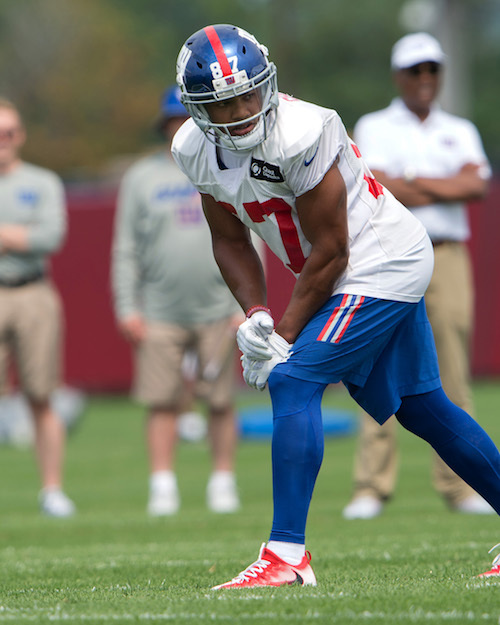 Wide receiver Victor Cruz (ankle) and offensive guard Justin Pugh (knee) did not practice on Friday. Safety Andrew Adams (shoulder) and defensive end Kerry Wynn (concussion) practiced on a limited basis. Quarterback Ryan Nassib (elbow) fully practiced. There is no media availability to the Giants on Saturday and Sunday. 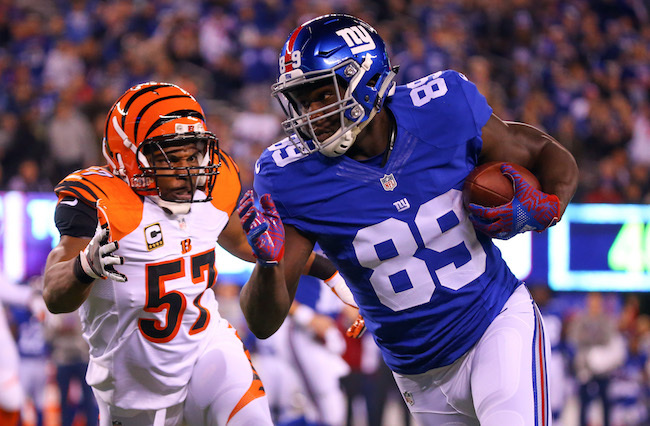 The Giants play the Cincinnati Bengals on Monday night at MetLife Stadium. Defensive end Jason Pierre-Paul (shoulder) has officially been ruled as “questionable” for Sunday’s home opener against the New Orleans Saints. Defensive end Olivier Vernon (wrist) was added to the injury report but is “probable” for the game. Defensive tackle Robert Thomas (illness) has been ruled out for the second week in a row. There is no press availability to the team on Saturday. The Giants play the New Orleans Saints at home on Sunday afternoon at 1:00PM EDT. 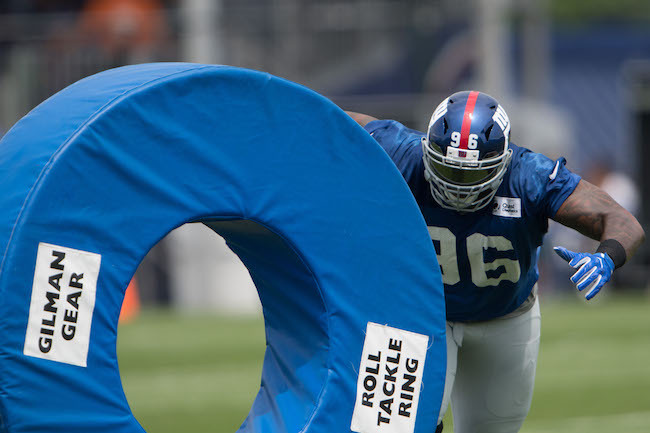 The New York Giants held their ninth summer training camp practice on Monday at Quest Diagnostics Training Center in East Rutherford, New Jersey. Quarterback Eli Manning had a virtually flawless practice, completing most of his pass attempts. He went 6-for-6 in a two minute drill that culminated with a touchdown pass. The first-team offense started off with Odell Beckham (wide left) and Victor Cruz (wide right) outside at wide receiver and Sterling Shepard in the slot. 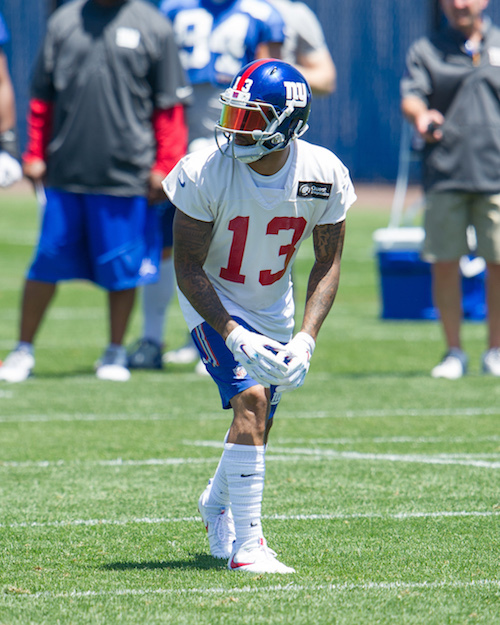 Wide receiver Odell Beckham also lined up in the backfield in one formation. Punter Brad Wing had a strong day with a number of booming punts and punts being downed inside the 10-yard line. Quarterback Ryan Nassib hit wide receiver Tavarres King deep for a touchdown, beating cornerback Leon McFadden and safety Mykkele Thompson. Quarterback Eli Manning hit wide receiver Odell Beckham for a touchdown against cornerback Dominique Rodgers-Cromartie, who had tight coverage on the play. Manning later found Beckham again for another red zone touchdown between cornerback Janoris Jenkins and safety Landon Collins. Linebackers Keenan Robinson and Kelvin Sheppard did a good job of stringing out a running play for no gain. Robinson made a few plays during practice. Cornerback Dominique Rodgers-Cromartie continues to see reps both outside and at slot corner. He had a few pass break ups in 7-on-7 drills. Cornerback Leon Hall also continues to work at the slot corner position. Quarterback Ryan Nassib hit wide receiver Roger Lewis with a bomb (against McFadden and Thompson again); Nassib then found running back Bobby Rainey in the flat who ran in for the score. Defensive end Owamagbe Odighizuwa stuffed a pitch play to running back Shane Vereen. In 1-on-1 drills, cornerback Eli Apple blanketed wide receivers Victor Cruz (twice) and Dwayne Harris (once) on throws into the end zone. In 1-on-1 drills, cornerback Dominique Rodgers-Cromartie broke up a pass in the end zone intended for wide receiver Myles White. In 7-on-7 drills, wide receiver Darius Powe caught two touchdown passes (VIDEO); tight ends Will Tye and Matt LaCosse each caught one touchdown pass. Bobby Hart received some first-team reps at right tackle. Wide receiver Darius Powe caught a deep pass pass against double coverage in 11-one-11 drills from quarterback Ryan Nassib. Powe took a big hit on the play but held onto the ball. Quarterback Ryan Nassib also hit wide receiver K.J. Maye deep for a big gain. Cornerback Eli Apple was flagged twice for illegal-use-of-hands penalties. Cornerback Dominique Rodgers-Cromartie broke up a pass over the middle intended for wide receiver Geremy Davis. 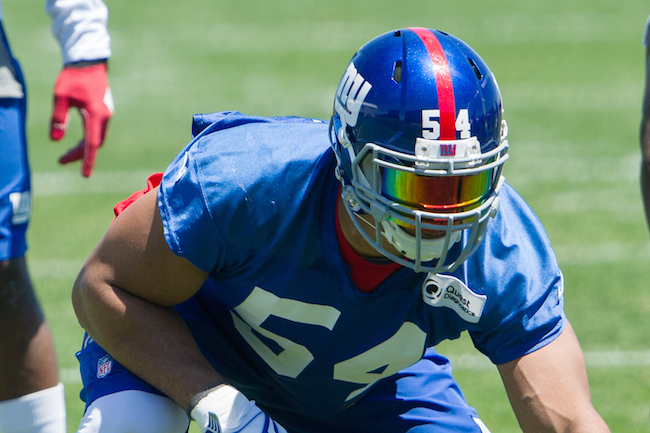 First-team nickel linebackers were Keenan Robinson and Jonathan Casillas. Cornerback Leon Hall and Dominique Rodgers-Cromartie practiced with the first-team at slot corner in the nickel defense. Cornerbacks Leon McFadden and Donte Deayon (against wide receiver Darius Powe) broke up passes in the end zone. Quarterback Eli Manning hit tight Larry Donnell twice over the middle for decent gains. Cornerback Eli Apple broke up a touchdown in the end zone against wide receiver Roger Lewis. Defensive end Jason Pierre-Paul picked up a loose ball fumbled by quarterback Eli Manning and returned it for a touchdown. Defensive end Olivier Vernon may have influenced the fumble. Linebacker Kelvin Sheppard stuffed running back Andre Williams at the goal line. In 1-on-1 drills, cornerback Janoris Jenkins had excellent coverage on wide receiver Sterling Shepard and knocked the ball away in the end zone. Wide receiver Tavarres King beat cornerback Leon McFadden for a touchdown on a pass from quarterback Ryan Nassib. 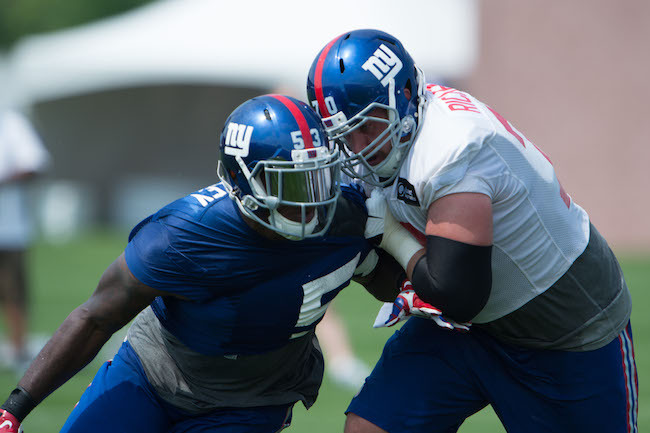 The New York Giants held their second summer training camp practice on Saturday at Quest Diagnostics Training Center in East Rutherford, New Jersey. “He’s getting closer,” said Head Coach Ben McAdoo of Thomas. Wide receivers Odell Beckham, Sterling Shepard, and Victor Cruz all worked with the first-team offense. Will Johnson worked with the tight ends and at H-Back. Adam Gettis practiced at center and Brett Jones at guard. Gettis also saw first-team reps at right guard. 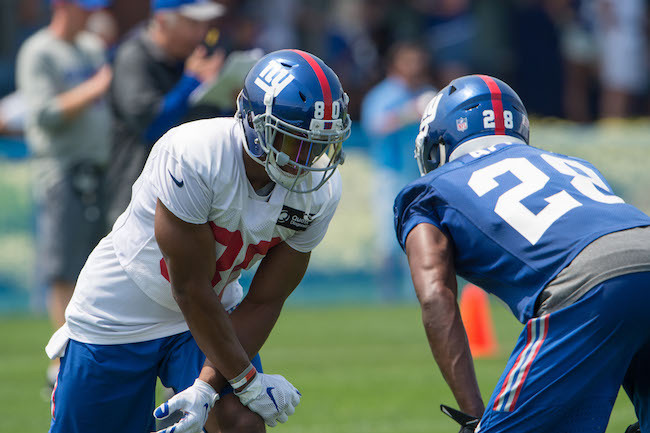 On the first play on 7-on-7 drills, linebacker Devon Kennard intercepted an underthrown pass by quarterback Eli Manning. Cornerback Dominique Rodgers-Cromartie worked at the slot corner position in 7-on-7 drills. Wide receiver Tavarres King beat cornerback Dominique Rodgers-Cromartie on a slant and then caught a bomb against cornerback Tramain Jacobs from quarterback Ryan Nassib. 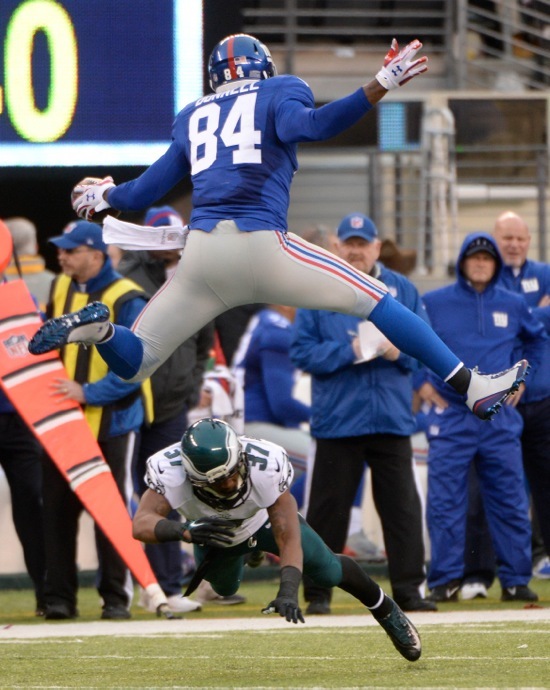 Tight end Larry Donnell flashed, including a reception down the seam and a diving reception. 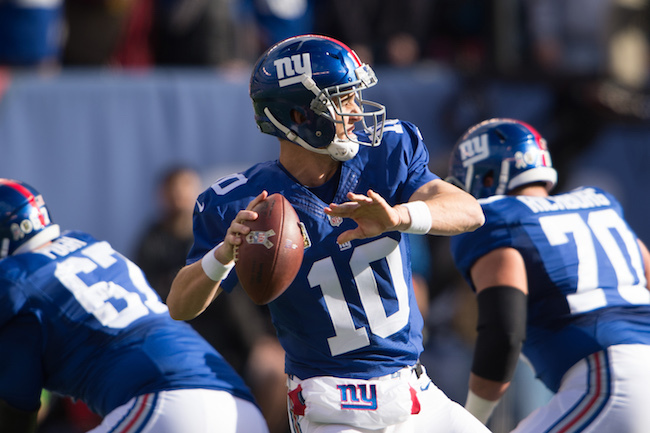 Quarterback Eli Manning hit wide receiver Geremy Davis for a red zone touchdown. Running back Orleans Darkwa ripped off a long run with the second-team offense. Montori Hughes and Greg Milhouse rotated with each other alongside Johnathan Hankins at defensive tackle with the first unit. Later in practice, the Giants appeared to be rotating Dominique Rodgers-Cromartie, Janoris Jenkins, and Eli Apple at the outside corner position while Trevin Wade worked more in the slot corner position. During the walkthru portion of practice, Eli Apple was the outside corner with Dominique Rodgers-Cromartie in the slot corner position. New York Giants wide receiver Odell Beckham, Jr. was ranked the NFL’s 10th best player on The NFL Network’s “Top 100 Players of 2016.” Beckham followed up his record-breaking rookie campaign with another superlative effort in 2015, finishing with 96 catches for 1,450 yards (15.1 yards per catch) and 13 touchdowns. The NFL Network’s video presentation of Beckham as the #10 player is available at Giants.com.